To my net friends, old and new ! I love teddy bears! They always put a smile on my face. They seem to have that effect on everyone ! I would like to put smiles on a bunch of faces all around the world! This is going to be a very big job ! My goal is to get the whole world smilin'! 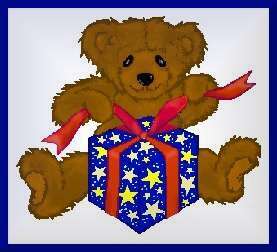 So please help me out and pass this teddy bear on to everyone on your list. A smile breaks all language bariers, so lets see how many different countries we can get smilin'!